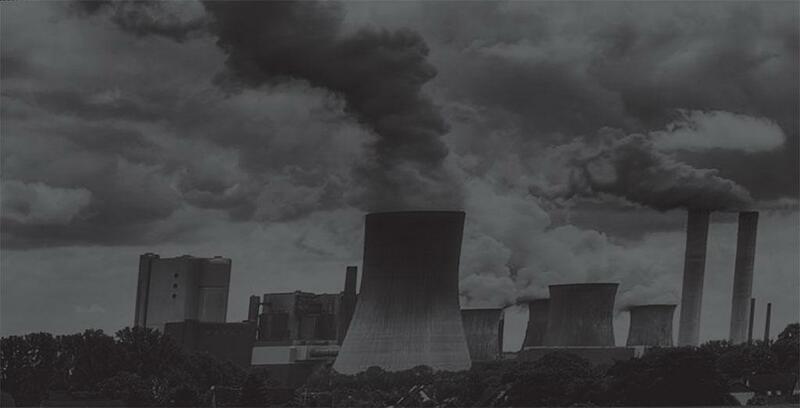 As you are aware, Thermal power stations are required to install emission control technologies to comply with the 2015 environmental norms as notified by the MoEF&CC. All stakeholders involved in the implementation process face multiple challenges - build knowledge about new pollution control technologies, undertake technology assessment with respect to suitability, performance and costs, track installation progress and finally ensure its continued operation. 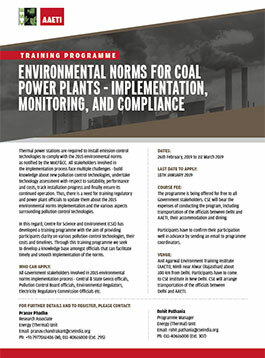 Thus, there is a need for training regulatory and power plant officials to update them about the 2015 environmental norms implementationand the various aspects surrounding pollution control technologies. In this regard, CSE has developed atraining programme with the aim of providing participants clarity on various pollution control technologies, their costs and timelines. Through this training programme we seek to develop a knowledge base amongst officials that can facilitate timely and smooth implementation of the norms. We request you to nominate 4-5 officials from your organization for this training programme. 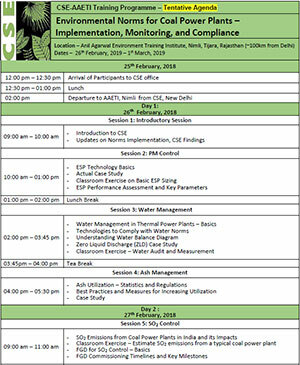 The programme is being offered for free, and CSE will bear the expenses of conducting the program, including transportation of the officials between Delhi and AAETI, accommodation and dining. We are sure that the officials will benefit from this timely program, thus leading to effective compliance of the norms within power plants. We look forward to participation from your organization for this training programme. All Government stakeholders involved in 2015 environmental norms implementation process - Central & State Genco officals, Pollution Control Board officials, Environmental Regulators, Electricity Regulatory Commission Officials etc. The programme is being offered for free to all Government stakeholders. CSE will bear the expenses of conducting the program, including transportation of the officials between Delhi and AAETI, their accommodation and dining. Participants have to confirm their participation well in advance by sending an email to programme coordinators. Anil Agarwal Environment Training Institute (AAETI), Nimli near Alwar (Rajasthan) about 100 km from Delhi. Participants have to come to CSE institute in New Delhi. CSE will arrange transportation of the officials between Delhi and AAETI.